The city itself is roughly at latitude -18.6, logitude -48.7, at an elevation of around 900m (~3000ft). It’s located in what’s known as the Mineiran Triangle, which is basically that Western part of the state of Minas Gerais jutting out in the map above (the part below the inset). Tupaciguara is a small city, with around 23,000 inhabitants. Uberlandia is the third largest city in the state, with over 600,000 people (source: wikipedia). The principal biome type is savanna. Some maps I’ve seen show small scattered areas of Atlantic Forest close to some of the waterways. I’ve yet to find any, and I suspect most disappeared when the rivers were dammed. The Minerian Triangle is a rich agricultural area. Much of the land has been cleared either for crops or grazing. In theory, all rural properties are required to set aside at least 20% of the land as a reserve. I get the impression that’s not strongly enforced. Driving along the major roads, you’ll notice small uncleared areas, but they are so small and disconnected as to be of questionable benefit. Crops I’ve seen include sugarcane, soybeans and corn. Cattle are plentiful. Getting around can be difficult. The paved roads are often heavily potholed, although that appears to be improving. The unpaved roads are generally passable, but only at a snail’s pace. 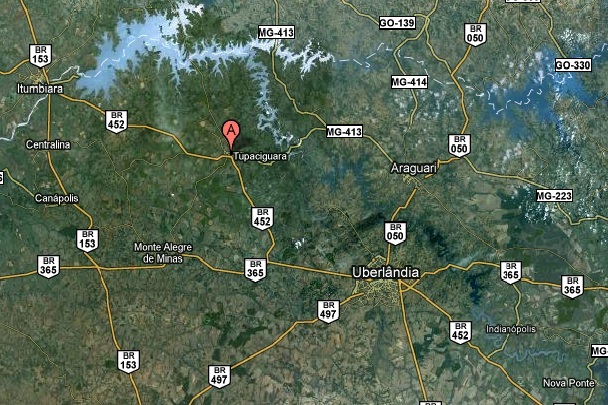 At the top of the satellite image above you’ll notice a large reservoir, created by a dam on the Paranaíba river. This lake is a popular recreational destination, especially for fishing. On the other side of the reservoir, in the neighboring state of Goiás, there’s another popular recreational destination. In and around the city of Caldas Novas there are many natural hot springs. This is an area I’ve only visited once but would like to explore more. I limit my photography excursions to isolated rural areas. Locals have advised me not to go out with any valuables in or near the urban centers. It’s a shame really, because there are some parks near our condo that would probably be interesting to explore with my camera. The rural areas I have been to, I never felt unsafe. Here in the US, I often tell people that ask me about the risks of going into the woods alone that I’m far more concerned about people than I am about snakes or bears or anything like that. Well, OK, people and stepping onto yellowjacket and fire ant nests. In Brazil, I have that same worry about people that are up to no good. I have to admit though that I’m equally concerned about the dangerous wildlife, particularly since I’m not all that familiar with what actually is dangerous. I’ve already had a couple of close calls that have given me a whole new level of respect for the possible dangers. More on those experiences when I post photos. This entry was posted in Location Profiles. Bookmark the permalink.